Before we get anywhere in this review, we have to have the talk. A friend of mine likes to call this talk a DTR, or Defining the Relationship. Usually with her it refers to something romantic but with the MacBook Air there are many similarities. It needs to be very clear what your expectations are of it and what sort of relationship you plan on having with the notebook in order to avoid something unpleasant. Are you going home with it? When Apple announced the MacBook Air, it was met with harsh criticism from many; it was almost as if the Air was being treated as the next MacBook Pro instead of an ultra portable Mac. Let me give you an example. Back in college I needed a notebook to take to class with me that I could take notes on and email/browse with during class (not all lectures were as captivating as I’d like). Lugging even a 5-pound notebook around to class was a pain, I wanted something whose weight and form factor resembled its name; I wanted a notebook, something very thin, very light and just as easy as a pad of paper to carry around with me. This wasn’t going to be my ultimate work machine, I wasn’t going to be running Photoshop on it, I just needed it to do some basic writing and web browsing. In many senses all I needed was a notebook-sized iPhone. Since writing and basic internet access were the main duties of this machine, things like hard disk space, having an internal optical drive and absolute performance weren’t really concerns; running Notepad or TextEdit just doesn’t require much. At the same time, having a good keyboard, a killer form factor and keeping weight down were all more important than with a regular notebook. Historically the ultra portable has been first and foremost, a very light notebook. The first ultra portables were around 3 lbs, but over the years we’ve seen entries into the space weigh in at less than 2 lbs. If you look at the weight of a textbook and remember how much you hated lugging that around in school, you’ll understand how even a 1 pound difference in notebook weight can make a big difference. The weight side of an ultra portable is only one facet of importance, form factor is the other. This thing has to feel small in your hands when carrying it around, it has to feel just as natural and painless as carrying a paper notebook around. The problem is that in the quest for small size and ultimate lightness, a number of sacrifices are made. Performance, keyboard, screen size/resolution, expansion, durability, battery life and price are all areas that you have to make sacrifices in if you want an ultra portable notebook. You give up performance because the cooling and power requirements of a high speed CPU just aren’t possible to satisfy given the form factor and weight requirements of an ultra portable. There’s no budget for a large battery and heatsinks need to be on the order of millimeters in thickness. Ultra Low Voltage CPUs are generally preferred here and it’s only recently that we’ve seen ultra portables really get faster than 1GHz. The screen size of a notebook actually determines the keyboard layout and size. In order to keep power consumption down, smaller screens with cramped resolutions are the norm in the ultra portable space. With a smaller screen, the keyboard that the screen covers when closed is similarly tiny. These two limitations generally run in contrary to one of the main uses for having an ultra portable: writing a lot becomes difficult. I owned a Sony X505 imported from Japan and it got me through my last year of college, but the keyboard was terrible to type on. It had a Japanese key layout so some of the key labels were in the “wrong” places. I had to rely on memory of a US keyboard layout to figure out which one to hit which is more difficult than you’d think on a keyboard with very small keys. Writing normal sentences wasn’t a problem, it’s the punctuation that really threw me off. My hands always had to do this strange ballet/gymnastics move in order to punctuate anything, which eventually drove me away from the notebook. Expansion is an obvious problem; most of the ultra portables I’ve owned over the years didn’t have integrated optical drives, which made installing applications or just reading a disc handed to me while on the road frustratingly impossible. In order to keep things light, ultra portables generally have tiny batteries and are built out of very lightweight materials - resulting in poor battery life and a hardly durable feel. The durability issue is compounded by the notebooks being very thin, which only makes them feel more likely to break. Admittedly I’ve never had an ultra portable break on me, but I’ve also never really dropped one. They do develop creaks over time just like other notebooks, there’s just no getting around that. And finally we have the issue of price; the culmination of all of these sacrifices is a very light weight, very portable device...that also costs a great deal of money. Spending $2K - $3K on an ultra portable isn’t out of the ordinary. Many consider Apple to be a leader in the computing world, but in many ways it is an attentive follower. Apple hasn’t historically been the first to introduce a new type of device, but rather a company that looks at where others have done poorly and attempts to do better. Apple didn’t invent the ultra portable, but with the MacBook Air it’s attempting to do it right. With that pesky DTR out of the way, let’s get to know the Air a bit better. On paper, the MacBook Air's size is impressive until you compare it to the MacBook - in many ways the Air is just a thinner MacBook. The screen is identical and the footprint is virtually unchanged. The two pounds Apple has managed to shave off and the reduction in thickness are huge, regardless of how small they may seem in numerical form. 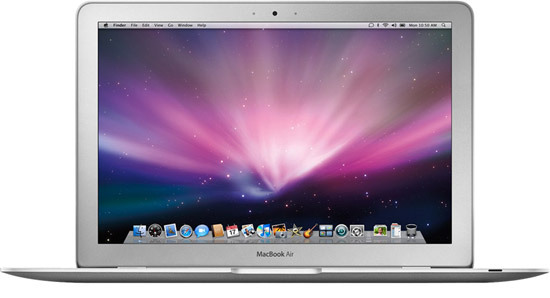 MacBook Air MacBook MacBook Pro 15"